Maryland Lottery & Gaming Director Gordon Medenica, right, greets Southern Maryland’s “Ravens Millionaire” and his family. The winner is flying high after a $1 million Mega Millions win. A Baltimore Ravens fan from Southern Maryland is flying high after becoming Maryland’s newest millionaire on Friday night. The Charles County man won the $1 million second-tier prize in the Aug. 10 Mega Millions drawing and was the only U.S. player to do so. His connection with Lottery luck happened at an Indian Head store only days before the drawing. “After waiting for a buddy who has classic cars, I figured I’d stop by Lee’s Market to get my numbers,” said the loyal Lottery player. The 58-year-old engineer, who dubbed himself “Ravens Millionaire” for Lottery publicity, bought a few Powerball tickets and a single Mega Millions ticket at the store. Last weekend, he was visiting his mom when he decided to check his $2 quick-pick Mega Millions ticket and a few others to see if he’d had any luck. The lucky millionaire, who was just one number shy of winning the game’s $63 million jackpot, arrived at Lottery headquarters on Monday accompanied by his happy family. Their stay in the Winner’s Circle included a visit with two special guests. 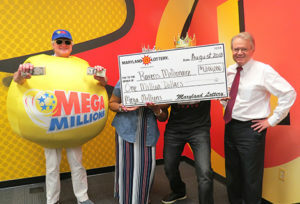 Gordon Medenica, Mega Millions Lead Director and director of Maryland Lottery and Gaming, and the Mega Millions mascot congratulated the happy winner. His lucky Charles County retailer is also enjoying the big win. For selling the $1 million ticket, Lee’s Market located at 4310 Hawthorne Road in Indian Head earned a $2,500 bonus from the Lottery. No one hit the jackpot Friday night, sending it rolling to $75 million for the Tuesday, Aug. 14 drawing. This was the third $1 million Mega Millions win in Maryland this year. One lucky $1 million ticket is still unclaimed from the June 26 drawing. That ticket hails from Tantallon Exxon in Fort Washington. This entry was posted on September 11, 2018 at 8:12 pm and is filed under All News, Charles News, Community, County, Good News, More News, z 600X120 Top Ad Bottom, z 600X120 Top Ad Top. You can follow any responses to this entry through the RSS 2.0 feed.